When Alexander Fleming discovered penicillin in 1928, many believed a magical bullet had been found and mankind would finally be able to control bacterial infections. Fast-forwarding 100 years, antibiotic resistance is a major public health problem and scientists and the medical community are scrambling to control it. 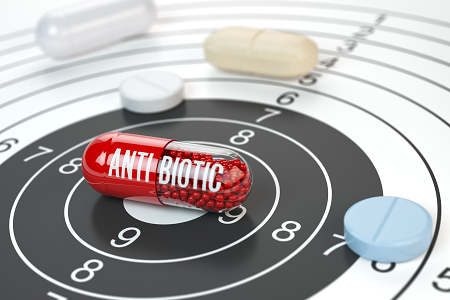 We now realize that the use of broad-spectrum antibiotics for the treatment of bacterial infections, while effective, contributed to undermining the activity of the very same antibiotics by selecting for resistant isolates. Thus, targeted therapy (ultra-narrow spectrum) for the management of bacterial infections becomes an appealing concept because it would allow physicians to adjust their treatments to provide the best outcomes and fewest negative effects while minimizing collateral damage to the patient’s microbiome. Scientists are currently focusing on the development of therapies and laboratory technologies that can help implement this concept of narrow-spectrum therapy. Despite efforts and some (though limited) progress in this area, important barriers for targeted therapy remain in place. This article will focus on approaches used to manage infections caused by common pathogens, the current landscape of targeted antibacterial therapy, and the challenges and areas of opportunity for both developers of antibacterial therapies and manufacturers of medical devices. Can the management of bacterial infections follow the path set by oncology? The field of oncology represents a counterpoint to the relatively nascent field of targeted antibacterial therapies and perhaps can provide a road map to how the antibiotic space might evolve. Until recently, cancer treatments (e.g., chemotherapy) were broad spectrum and targeted cells indiscriminately; they killed cancer cells, but also the host’s healthy cells and tissue, causing collateral damage and adverse effects. With the advent of genetic testing, it became possible to identify genetic variants and to develop therapies targeting them. As a result, treatments became more personalized and adjusted to each biomarker-defined patient subpopulation. From the HER2 inhibitors used for the treatment of breast cancer, ALK and EGFR inhibitors in non-small cell lung cancer, immune checkpoint inhibitors across multiple indications, and CAR-T in hematological malignancies, oncology has made great strides, reflected in increasingly safer and more-effective treatments. Innovation in oncology was driven by multiple factors, but particularly by a better understanding of the mechanisms involved in disease. Diagnosis of cancer was traditionally made through the phenotype of the lesions and their histological analysis, but broad access to DNA and RNA sequencing technologies offered new insights into the characterization of those cells. In addition, new approaches that offer further characterization of the proteome and metabolome of cancer cells are under development, which may lead to even more personalized approaches to treatment. What does targeted treatment mean in the context of bacterial infections? Similar to early-generation cancer therapies (e.g., chemotherapy), current antibacterial therapies have a broad spectrum of activity, meaning they are active against the pathogen but also the host’s microbiota. This collateral damage to the microbiota can select for resistant bacteria and be a risk factor for Clostridioides (C.) difficile infections. Additionally, there is increasing evidence of the association of the microbiome with diseases such as diabetes and asthma, and this antibiotic-induced disruption may have a negative impact. Therapies that are selective for a specific pathogen, group of pathogens, or virulence factors: Because of the similarities among different species of bacteria, it is difficult to develop agents that specifically target one species. Although there are no approved therapies that fit this definition, Polyphor’s Murepavadin, a Pseudomonas-specific antibiotic, is undergoing Phase 3 development for the treatment of ventilator-associated pneumonia and could become the first approved agent with those properties. Other companies such as Aridis are developing therapeutic antibodies for different bacterial species, like Staphylococcus aureus and Pseudomonas, to be used as adjunctive therapy to antibiotics, which would allow a more personalized approach for the treatment of infections. More recently, bacteriophages, highly specific viruses that attack bacteria, have garnered renewed interest, and some companies have started to explore their clinical development. While devoid of antibacterial properties, Merck’s recently approved Zinplava (bezlotoxumab) is a specific toxin-neutralizing antibody that is used as adjunctive therapy to antibacterial treatment of patients with C. difficile; by neutralizing one of the clostridial toxins it prevents further damage to the intestinal epithelium, reducing the rates of recurrence. Antibacterial therapies with narrow (but not ultra-narrow) spectrums of activity are relatively easier to develop and therefore more common, and include Merck’s Dificid/Dificlir (fidaxomicin), macrolides, glycopeptides, and Summit’s developmental ridinilazole. Therapies that retain activity against pathogens that have acquired mechanisms of antibiotic resistance: There are cases where antibiotics may lack activity due to the development of antibiotic resistance. From a clinical perspective, it is important to predict an isolate’s susceptibility to the use of a specific antibiotic in order to achieve clinical success, but there are also benefits from antibiotic stewardship and economic perspectives. Merck’s Zerbaxa, Melinta’s Vabomere, Allergan/Pfizer’s Avycaz/Zavicefta, Achaogen’s Zemdri, and Tetraphase’s Xerava have all been approved in the last five years and have broadened the availability of therapies for the treatment of antibiotic-resistant infections. Some of those therapies combine beta-lactam and beta-lactamase inhibitors; in one case the novel molecule in the combination is the beta-lactam inhibitor (Zerbaxa), in others it is the beta-lactamase inhibitor (Vabomere, Avycaz). In addition, many therapies in the pipeline are specifically being developed to be active against difficult-to-treat infections due to resistant pathogens and will help to increase the available armamentarium. Can new laboratory techniques contribute to more personalized treatment? Traditional techniques for pathogen identification and determination of antibiotic susceptibility are time consuming, and, assuming a best-case scenario, they require a minimum of two days to provide conclusive results. Patients with bacterial infections have increasingly poor prognosis, and each hour of delay in initiation of treatment contributes to a worse outcome. As a result, it is critical to initiate therapy as early as possible, even before results of pathogen identification and antibiotic susceptibility are known. This urgency drives the use of empiric therapy, where physicians combine one or two different antibiotics with broad-spectrum activity in an attempt to cover for as many potential causative pathogens as possible (e.g., gram-negative pathogens as well as MRSA) while they wait for laboratory results that identify the pathogen(s) and susceptibility profile. Over the past three to five years, the workflow in clinical microbiology laboratories has started to shift. One of the biggest changes is the development of, and subsequent access to, technologies that provide physicians with diagnostic and susceptibility results within hours — or even minutes — instead of several days. MALDI-TOF, nucleic acid-based techniques, and fluorescence are just some examples of newer, rapid diagnostic tests that can replace traditional microbiological assays. However, these new techniques frequently come with a hefty price tag (procurement and operation costs) that makes them more expensive than traditional microbiology techniques and may require specialized personnel and equipment. Despite the high costs, the results obtained from rapid assays can allow for more personalized treatment for each patient and can have significant benefits. Those benefits include less-selective pressure on the microbiota (which has important stewardship implications), faster time to appropriate therapy, therapy adjustment and de-escalation of therapy (e.g., switch to MRSA-only agent from broad spectrum coverage), and decrease in economic costs resulting from hospitalization and adverse effects. The development of new antibacterial therapies, particularly those that target specific bacterial species or antibiotic-resistant pathogens, can also benefit from the availability of such assays. Recent regulatory changes by the FDA allow the use of small pathogen-specific trials data to support regulatory filings, and several developers have started to evaluate their agents in trials that enroll patients with infections caused by specific bacterial species and/or antibiotic-resistance profiles. What is preventing more personalization in the therapeutic approach to bacterial infections? Limited availability of specific or very narrow-spectrum therapies: As discussed before, most currently used agents have a broad spectrum of activity, although there are several narrow-spectrum agents in the pipeline. Because of the overlap of targets across different microbial populations, it can be more difficult to develop narrow-spectrum antibiotics than narrow-spectrum cancer therapies. In the oncology field, the understanding of molecular targets that are associated with cancer has allowed the design of molecules that specifically target cancer cells, sparing normal cells. Lack of commercial incentives for drug developers: The antibiotic market is heavily genericized, so it takes long for developers of antibiotics to obtain a return on their investments. Unlike cancer, where there is a higher willingness to pay for costly therapies, payers are less willing to pay a premium for antibiotics. The currently available tools to measure the value of antibiotics for individuals and society frequently undervalue the benefits provided by antibiotics; this has implications in terms of reimbursement. Most antibiotics are reimbursed via a diagnosis-related group (DRG) mechanism, which provides a lump sum for diagnosis, treatment, and delivery of care. Furthermore, clinical trials evaluating narrow-spectrum agents also face challenges due to a more-limited eligible patient population and difficulties in the identification of those patients. Time: Because of the limited penetration of novel technologies, the turnaround times for obtaining diagnostic results on bacterial infections remain long. In contrast to cancer, which has slower development rates and patients do not often require immediate treatment, most bacterial infections have an acute onset and, because of the urgency for treatment, physicians resort to the use of broad-spectrum antibiotics. Additionally, upon receiving laboratory results, physicians frequently do not adjust their therapy. While it is possible to still have a positive outcome for an individual patient, the inadequate usage of antibiotics may have negative implications by causing collateral damage and selecting for antimicrobial resistance, which may hinder the efficacy of future therapies. This is not the case in oncology — although cancer cells may develop resistance to treatments, there is no collateral damage for future patients. What are the key takeaways for drug and device developers? The antibacterial market is unique in that the efficacy of a drug is frequently not tied to its commercial success; the use of the most-effective and typically higher-cost therapies is frequently reserved for cases where alternatives aren’t available. Our recent work has demonstrated the importance of drug developers and medical device manufacturers collaborating early, whether to develop laboratory tools to support the use of antibacterial therapy, to capture pharmacoeconomic data, or to demonstrate to physicians the advantages of such approaches. Multiple decision-making stakeholders can influence the implementation of a more targeted therapy, and it is important to understand what drives physicians’ prescribing and what evidence payers require in order to make decisions. The director of a clinical microbiology laboratory in the Netherlands once told me: “I anticipate that soon microbiology will move at the pace we are seeing with pathology.” With a varied antibacterial pipeline and the new advances made in the clinical microbiology laboratory, we are closer to being able to implement targeted therapy more broadly. However, there is work to be done, and developers of new antibiotics and manufacturers of medical devices need to collaborate closely in order to achieve it. Nuno T. Antunes, Ph.D., is senior business insights analyst on the infectious, niche, and rare diseases team at Decision Resources Group, specializing in antibacterial agents. Previously, he was a Latin America market access senior analyst on the global market access insights team, where he developed expertise in market access, pricing and reimbursement, health technology assessment, and health policy. He holds a Ph.D. in animal health from the Universidad de Las Palmas de Gran Canaria, Spain, and a D.V.M. from the Universidade de Trás-os-Montes e Alto Douro, Portugal. Prior to joining DRG, he conducted research in antimicrobial resistance and antimicrobial development and worked in the medical device industry as a scientist.